An ant infestation on your kitchen counter is gross. But if you can conquer your revulsion and observe the ants, you'll notice that they have some invisible way of communicating. Ants secret pheromones to mark a trail, and they detect them with their super-sensitive antennae. You can mask the pheromones, disrupt communications and clear your counter by spraying a solution of vinegar and water. It isn't possible to ask an ant's opinion about the smell of vinegar, but observing ants in the vicinity of an area that has been sprayed with a vinegar and water solution suggests the answer would be something like "yecchh!" 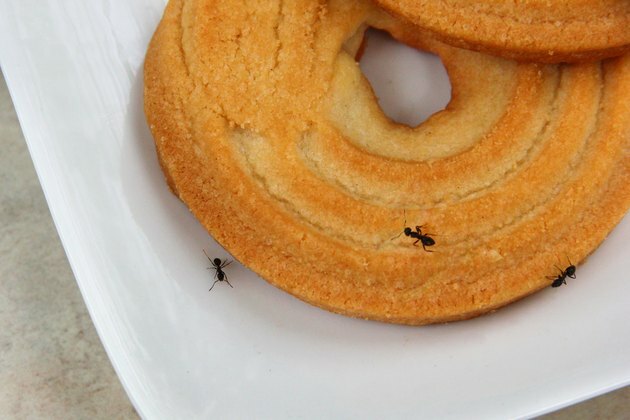 In one experiment, a homemaker with an ant problem sprayed a circle around a group of foraging ants, and they remained confined within it until the vinegar dried. Add to that the apparent fact that vinegar -- probably by virtue of the acetic acid it contains -- neutralizes the pheromones the ants secrete, and you have a good way to chase ants away from your food. Spraying sensitive areas in your house with vinegar and water may provide more than temporary relief from ants. Another homemaker reports mixing a solution of 3 parts white distilled vinegar with 1 part water and spray-soaking her kitchen countertops, cupboards and window and door frames. After half an hour she wiped up most of the solution and left the rest to dry. She reports that the ants that had been bothering her never came back. As far as humans are concerned, the strong smell of vinegar dissipates after a few hours, but it probably affects ants for much longer. In any case, respraying every other day or so is good insurance against a re-infestation. Besides being useful for ant control, vinegar is a disinfectant and deodorizer, and it tastes good on French fries, too. It does have a disadvantage, though; it can dull certain floor and furniture finishes. Before spraying vinegar liberally throughout your house, it's wise to test it on inconspicuous parts of hardwood, laminate or vinyl floors, laminated or stone countertops, and finished wood furniture. Spray a small area, let the vinegar stay for half an hour, then wipe and compare the area you sprayed to the rest of the surface. If you notice a difference, reduce the vinegar concentration, wipe the vinegar off sooner or consider another control method. Vinegar concentrations from 25 to 100 percent can effectively erase ant trails and interfere with the insects' ability to smell food. You can use vinegar to control an existing trail -- you can even spray the ants directly -- but the most effective use of vinegar is as a deterrent. 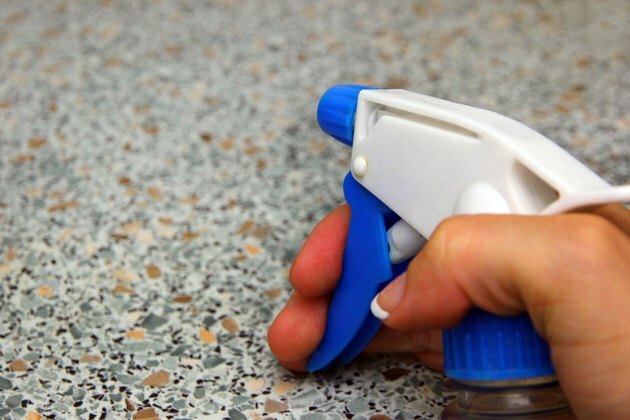 Once you've determined it's safe to do so, spray if on the floor, countertops, walls and baseboards -- especially near the openings you see the ants using. Regular spraying -- every few days or so -- will discourage the ants, and they will probably start looking for food elsewhere.